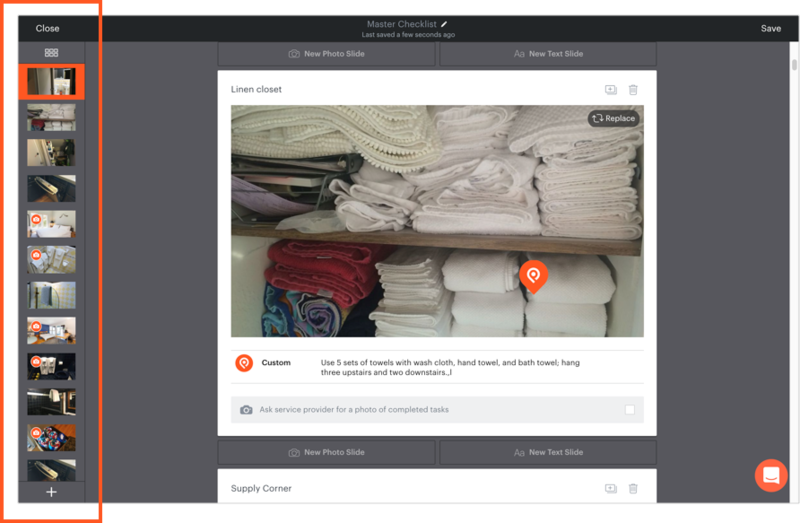 Use photo slides to show your service provider what rooms should look like once they’re cleaned and staged, or to provide more in-depth instruction on how to perform a task. You’ll get visuals for your photo slides from your photo gallery for each property. If you connected your account to a listing platform or PMS, you’ll already have photos imported into your Properly listing for each property. You can use these photos to create visual slides. Open any checklist and click “Add Photo Slide.” The photo gallery for that property will appear. Select a photo to use in your visual slide. 3. Add text notes by writing them next to the pin underneath the photo. Select “Ask service provider for a photo of completed tasks” under that photo slide. Click and drag the slide in the lefthand sidebar. Remember to Save the checklist. If you take photos of your property on location and want to add them to your Property Gallery, you can add them directly from your phone using our mobile app. Then you can customize your checklists from the web or mobile app. You may need to add more photos to provide more precise instructions for your service providers. While you probably already have a photo of the living room when it’s perfectly staged, you may not have a close-up of the thermostat that you can use to show the service provider how to set the temperature for a guest’s arrival.